IDE Scripting is the ability to create scripts that allow you to manipulate the Xojo user interface (IDE). IDE Scripts use the XojoScript engine and support the Xojo programming language, a subset of functions and other IDE Scripting Commands. To create an IDE script, select IDE Scripts ↠ New IDE Script from the File menu. This opens the XojoScript Editor. You can open multiple IDE Script editors, each with their own scripts. In this editor you write code using the XojoScript scripting language, which consists of Xojo programming language commands (such as If..Then or For..Next). You can also use special IDE Scripting commands such as DoCommand, DoShellCommand and more. All the IDE Scripting commands are listed in the IDE Scripting Commands section. To run the script, click the Run button on the Xojo Script Editor toolbar. IDE Scripts are saved as text files and are not included within the project. To save a script, use File ↠ Save or Save As. To load an existing script into the Script Editor, use File ↠ Open. 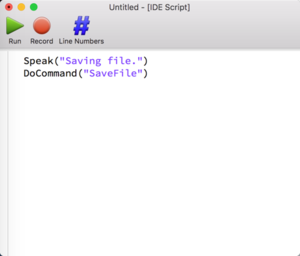 IDE Scripts can use Xojo language commands in addition to the commands described in the IDE Scripting Commands sections. On the XojoScript Editor toolbar is a Record button. When pressed, any commands in the IDE that have a corresponding script command are recorded when they are used. To try this, click the Record button (the text changes to "Stop Recording") and then select File ↠ Open to open a project. As you use the IDE, any actions that have corresponding script commands will appear in the XojoScript Editor as they are recorded. All these recordable commands are listed on the DoCommand page. This page was last edited on 25 February 2019, at 16:43.